Beaches are a relaxing place to spend a family trip or just enjoy a raging, booze-fueled spring break. While a trip to the ocean can be packed with fun, it can also be dangerous. Aside from sunburns and jellyfish, one of the most dangerous things you have to look out for is a silent, sloshing killer: rip currents. Most people die from things that are beyond their direct control, such as cancer or heart attacks. Sure, some cases of cancer or fatal heart issues can be prevented with long-term changes in behavior, but there's rarely a specific cigarette or steak that sealed your fate. On the other hand, some deaths occur as a direct result of someone's actions, like a missed rung on the ladder, failing to look both ways before turning left, or showing your friends that cool trick you can do with your new pistol. Dying in a rip current is one of those deaths that is completely avoidable. Nobody should die in a rip current, especially not in an age where we're constantly online and the National Weather Service (and every local news station and reputable weather outlet) advertises days where there's an elevated risk for rip currents. Between 2004 and 2013, nearly 50 people drowned every year as a result of rip currents—over the same period, that's more than the average number of people who die from lightning strikes! If all but a few dozen of us can get along fine without getting electrocuted by the sky, people should have no issue keeping themselves safe from getting kidnapped by Poseidon. 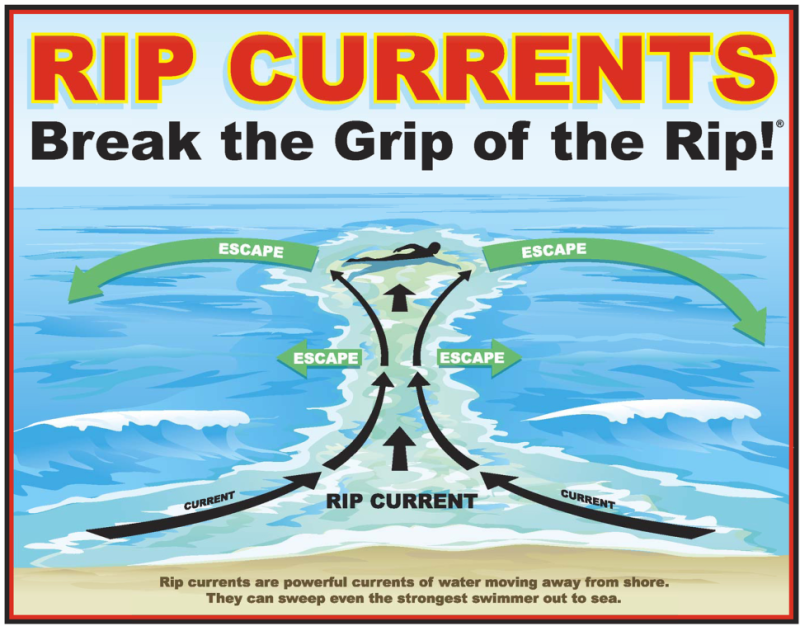 A rip current is a strong jet of water that quickly flows away from shore. Swimmers who are caught in rip currents can get sucked away from safety at speeds of nearly ten feet per second—far too fast for you to try swimming back to the beach. Fortunately, meteorologists can predict conditions favorable to the formation of rip currents, and swimmers almost always have ample warning that rip currents are possible or occurring. On a normal day, waves crash against the shore at an angle, allowing water to come in and flow back out with little more than a tug at your feet. Larger waves can knock you over and create a bigger tug back out to sea, but it's easy for most people to overcome the normal push and pull of the water. It's when the waves crash perpendicular to the beach that we start running into problems. As shown above in one of The Vane's famous poorly-drawn diagrams, a horizontal circulation forms in the water when waves crash perpendicular to the shore. Some water flows back to sea underneath the waves, but a good bit of it will start traveling parallel to the beach in a "longshore current." When waves crash along the beach at an angle, the longshore current flows in the same direction, but when they break perpendicular to the shore, it creates a longshore current that goes both left and right of the wave. A strong offshore current will develop when two longshore currents collide with each other, and water in these colliding currents will rush back out to sea as a rip current. These dangerous currents are most common when it's windy, but hurricanes that are hundreds (if not thousands of miles) away can kick up waves that create dangerous rip currents even when the weather is calm and sunny on the beach. The first, obviously, is to listen to the lifeguards or weather forecasts when they tell you not to go in the water because the risk for rip currents is too high. People drown trying to save other people from rip currents, so don't risk someone else's life because you're too stupid or rebellious to follow instructions. Beaches across the United States will raise flags on the beach letting visitors know what conditions are like that day. 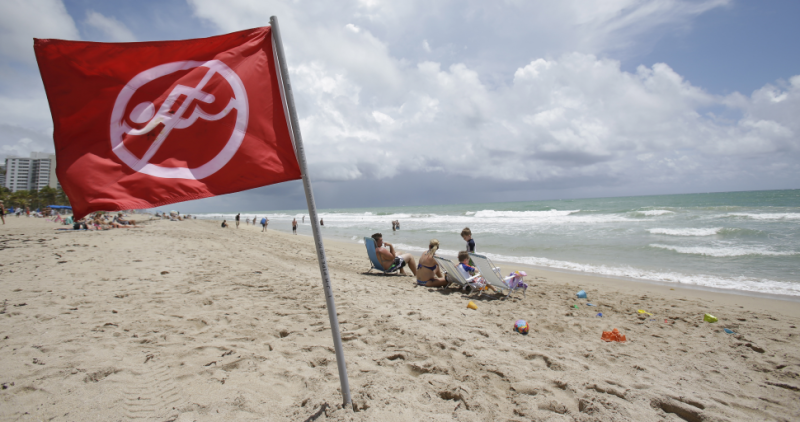 A yellow flag means "medium hazard," or "moderate surf/rip currents," and a red flag means "high hazard." Two red flags means that the water is closed because high surf or strong rip currents are too dangerous for swimmers. Rip currents also provide visual cues for you to identify potential hazard zones before getting in the water. One of the best visual identifiers of a rip current is to look out for gaps between the waves. The calmer gap between waves may look safer for you to play without worry about waves washing over your head or overtaking little Timmy, but a small patch of calm water in an otherwise choppy sea is often a rip current. 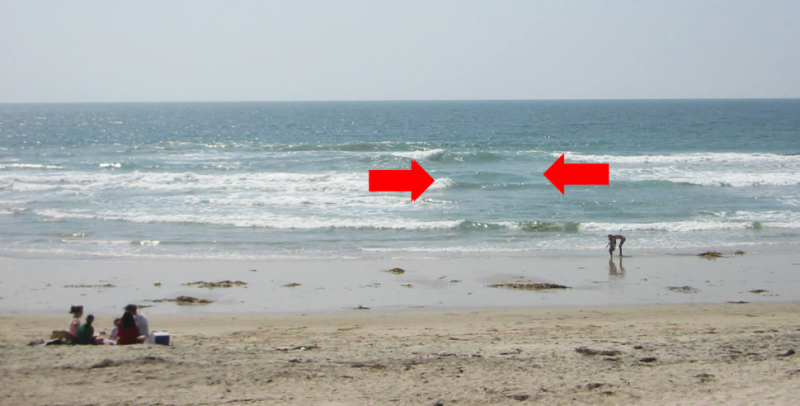 One of these gaps is pictured above—the rip current is in between the two red arrows. NOAA has dozens of photos of rip currents on their page dedicated to the phenomenon. Now, rip currents don't pull you under the water like so many television shows use as a plot device; instead, they pull you away from shore very quickly. If you're ever caught in one, don't panic. 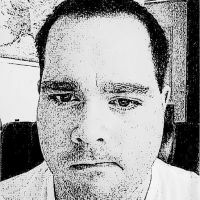 You'll start drifting away from the shore and your first instinct will be to panic and try to swim back as quickly as possible. Even the best swimmers can't swim against a rip current—since you can't fight the power of the water, you have to be smarter than the water. If you're a good swimmer and you find yourself getting pulled out to sea, you have to swim parallel to the beach so you can get out of the current. Once you escape the influence of the outbound water, you can start swimming back towards shore. If you're not able to swim out of the current, signal for help by waving (not flailing) your arms and calling out for help while you try to stay afloat. The current will eventually let up and you'll stop driving away from shore; by that point, it's a matter of being able to stay afloat long enough for help to arrive. As much as people don't want to hear it, getting caught in a rip current is your fault if you ignore warnings and don't know what to look out for. Don't drown (or risk the lives of those who have to save you) because you're determined to go swimming even though it isn't safe to do so. Thinking "it won't happen to me" is the best way to make sure it happens to you.